The Calman Steering Group is to be reconvened under the chairmanship of the new Secretary of State for Scotland Danny Alexander. The announcement came following a constructive meeting today between Scotland Office Minister David Mundell and Scottish Labour Leader Iain Gray, and discussions with the other members, in the wake of yesterday’s Queen’s Speech. The Group was originally set up to look at the implementation of the Calman Commission recommendations and had representatives from the Conservative, Labour and Liberal Democrat parties at both Westminster and Holyrood. 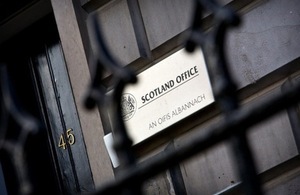 Following the recent constructive talks in Edinburgh between the Prime Minister and the First Minister, the Scotland Office will also now have a dialogue with the Scottish Government on the Calman recommendations. “The implementation of Calman recommendations is very important to Scotland. We have shown a commitment to talking to the Scottish Government on how best to take this forward and it makes sense at this time for the Steering Group to continue to meet ensuring dialogue across and between all the main parties.